Save at Sears and keep your car running great. The running around town really can take a toll on your engine. Do you normally go out to get your oil change and are looking for a great oil change deal? Are you tired of waiting for someone to change the oil in your car? Are you the do it all Mom that has been changing your own oil in the driveway and having a terrible mess to clean up? Now is the time to get in and get the oil changed in your car. The great advantage of going to Sears is that while I am waiting for my oil change, I can do all of my shopping done in the store! Soo it’s already getting to be that time again, it’s past the three month/3000 mile mark already, I know it is for me. 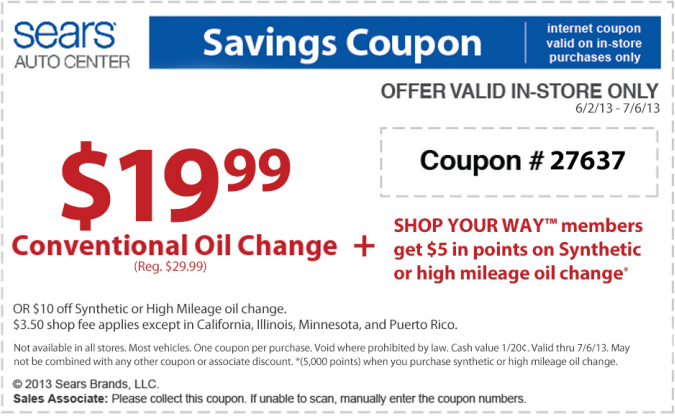 Here is one of my favorite Sears oil change coupon deals. Just $19.99 for the conventional oil change, or you can choose $10 off your synthetic or high mileage oil change if that’s what you need. PLUS, if you are a “SHOP YOUR WAY” member you will also recieve $5.00 in points for your high mileage or synthetic oil change! It’s worth being a part of the program. Sears has a great reputation for all of your auto repair needs, and using this coupon will keep your car’s engine running great and it won’t cost an arm and a leg. With this great discounted Sears Oil Change Coupon, it will be easy to run down to your local Sears Automotive Center and get your oil change quickly and efficiently. You can print the Coupon on the Sears website. There are a lot of other deals there, like tire discounts and brake coupons.